An ambitious young executive chooses a loveless marriage and an unfulfilling personal life in exchange for a successful Wall Street career. The fashion industry and Paris provide the setting for a comedy surrounding the mistaken impression that Joanne Woodward is a high-priced call girl. Paul Newman is the journalist interviewing her for insights on her profession. Lady L is an elegant, elderly lady who recalls the past loves and lusty adventures she has lived through. A promising lawyer tries to handle his social and professional problems while climbing the ranks in Philadelphia. All about the citizens of Putnam's Landing and their reactions to an army missile base in their back yard. A family of fiercely independent Oregon loggers struggle to keep the family business alive amidst changing times. A Love So Spectacular, So Personally Exciting, You Feel It Happening To You! Lillian Corning: You know, everybody's always waiting for everybody else to take a chance because they're so afraid! Recorded at Reeves Sound Studios, New York on May 2 & 3, 1961. Q: Midwest Premiere Happened When & Where? PARIS BLUES won't change your life unless you were one of those people (and I count myself one of them) that has been teetering on the verge of Euro-philia and this is the final straw to make you sell off all that crap you've acumulated over the years and live like a peddler just to be in Paris. Even if you are not, this movie could make you think twice. The core of the film is basically by-rote romances that, in themselves, would be non-descipt except for the fact that nothing Paul Newman touches can be bland. It is the elements surrounding these two romances that makes the film worth watching. Generally, to be a watchable film, the sum of the parts have to add up to more than the whole. Here, the film is simply the sum of it's parts...and those parts are wonderful. 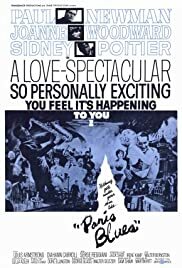 If I was to tell somebody there was a film out there where Paul Newman romances Joanne Woodward in a fifties jazz club in Paris alongside Sidney Pointier while they compete with Louis Armstrong most would go "What?Where? What movie?" which was exactly my reaction. Paris, Jazz, coffee...Newman. It's a confection with absolutely no nutritional value and yet you feel so much better having tried it. 20 of 32 people found this review helpful. Was this review helpful to you?